Take three bored paddlers and a night in the pub and the result is usually something interesting. 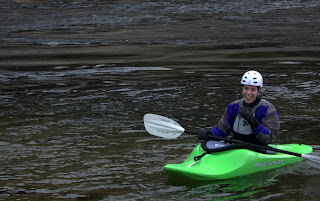 In this case it turned out to be New Years Day paddling - somewhere. 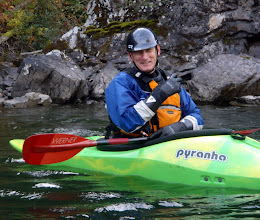 The trick was to find ice-free water on January 1st, not an easy task in Central BC. However a friend had explained that Tatlow Falls in Smithers was open due to the warmer than usual Winter. Plan A was to hike into Tatlow through the snow and surf the falls, then hang out with friends and celebrate the New Year. The night before we were due to leave however, we got pictures showing Tatlow frozen solid. A quick rethink (again, in the pub) and the next morning we were headed to Prince Rupert to surf Butze, a tidal rapid off the coast. A combination of early tides, hangovers and a long hike to the put in meant that Butze was dropping quickly when we got to it, a couple of hours paddling on small waves and a pourover hole whilst the rain blew in horizontally and we'd had enough. It was time to make the 800Km drive back. Still, spending New Year with good friends in a hot tub under the stars was something I won't forget in a hurry. 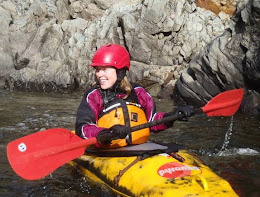 We decided that we needed to be more organised if we were going to road trip, so came up with the idea of heading South to paddle in warmer climes. So Hayley, Jason and I loaded our boats and gear and began the long drive towards Vancouver. Plan was to find a river that would allow us to do some basic eddy turns and rolls in the cold, then find something more entertaining. We headed south and spent the night in Abbotsford, with no real idea what to paddle the next day since both the Seymour and Capilano rivers (plan A and B respectively) had now dropped to an unrunnable level. After more beers and another late start we visited Western Canoeing and Kayaking and wandered around like kids in a candy store for a bit. 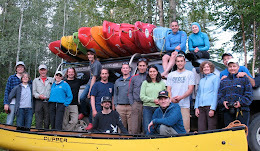 We left with a guidebook and plan C, which was to paddle a section of the Chilliwack, a nice solid class II run. With only one vehicle we decided to paddle down and then hitch-hike back to the truck. 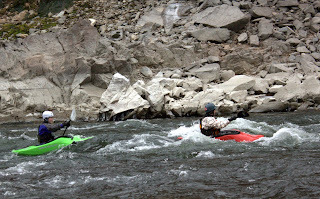 The put-in rapid provided a bit of surfing and entertainment whilst everyone geared up and carefully climbed down the snow covered bank to the river. After that it was a nice run through wave trains with the odd catch-on-the-fly wave or small hole. Fishermen seemed the biggest hazard with one on almost every bend or rapid. Still they were all very courteous, except for one who seemed to think we could just duck under his river-wide line. Hayley had managed to nail her first ever combat roll after going over on a seam but given that she was wearing a thin drytop and wetsuit she was severely cold by the end of the run. We hauled out as soon as the road was in sight and then made her run up the road to hitch a lift, very gentlemanly I'm sure but at least she stayed warm :) Very quickly a fellow paddler ran her back to the truck and soon we were all sat in a pub feeling considerably more human for a hot chocolate. Sunday we were in Vancouver and sadly the river levels were still too low despite (or possibly because of) a layer of fresh snow. So we entertained ourselves by paddling around the sea wall, throwing a few squirts and stalls to the amusement of those walking around Stanley Park. Leaving sunny Vancouver and heading back ten hours to find PG at minus 26c was not much fun. But every trip has to end before the next one starts :) Meantime paddling will be in the pool, at least until I get the feeling back in my toes. Roll on spring! Thanks to Hayley and Jason for the massive amount of driving and of course for their company, as well as Ross and Irene and Hayley's family for the awesome accommodations, and Tyler for the drinks ;) Pics by Jason and myself.